Hello to all of our loyal readers around the world! 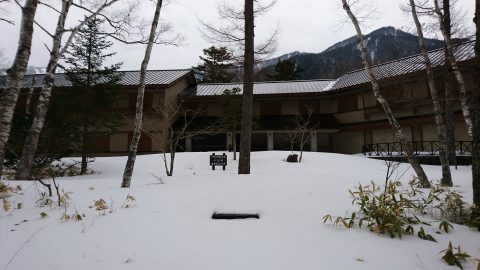 With fewer than 20 days left before Kamikochi’s official opening, I’m so busy rubbing my hands together in anticipation that I’m having a hard time keeping them on the keyboard. And regular readers of this blog will know that the unofficial opening, on April 17th, is even closer. That’s right, some areas of the park still have meter high snow banks. As we near the unofficial opening on the 17th, snow will melt or be cleared and paths will become easier to walk on. But don’t be surprised if some areas are still difficult to access without a sturdy pair of boots. Daytime temperatures in late April hover around the 10 degrees Celsius mark. Early morning temperatures are significantly lower at about 2-3 degrees. But don’t assume that you won’t need protection from the sun. UV levels are high at that altitude and get progressively higher as we enter the Golden Week holiday. Remember to wear a suitable hat. For outerwear, we recommend layering with a warm fleece and weather resistant jacket over top. If you find yourself getting warm you can stow a layer in your pack. Better to have it and not need it than need it and not have it, right? Expect the snow to be about 70% melted on the footpaths. You can easily walk from Tashiro Bridge to Kappa Bridge, but some of the paths linking Kappa Bridge to Myoujin and Taisho Pond to Tashiro Bridge may be closed depending on conditions. 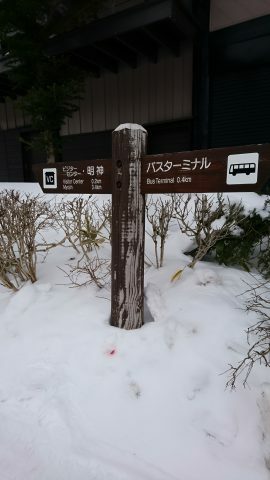 The path on the left bank of the Azusa River (on the same side as the bus terminal) from Kappa Bridge to Myoujin has mostly been cleared, but there may be a few patches of snow where there’s no direct sunlight. 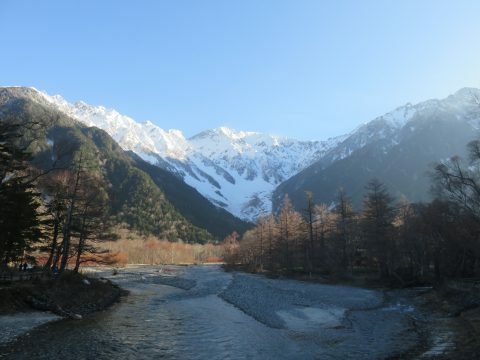 So what’s the appeal of Kamikochi in the early spring? In a word, scenery: the mountains on the horizon are still snow capped and looking as beautiful as they will look all year. The still wintery air is clear and deep blue on sunny days, providing an idea backdrop to such scenes. OK, that’s all for this week’s blog, but with the start of the season right around the corner, we’ll be raising our game with updates in the coming weeks. 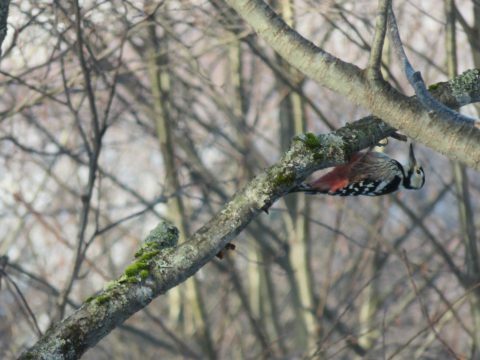 Thanks as always to Sakura, the hard working blogger for Nature Guide Five Sense who makes posts like this possible. And to our readers, see you all soon at the Gateway to the Northern Alps!